The entry to one's home is important because it makes a statement about the person who lives there and can leave a lasting impression. I like to utilize hardscape, plants, color, texture, water features, gates, and arbors to create welcoming entry statements that compliment a home's architecture. Here are some tips on achieving "curb appeal." 1. Consistency: Keep the design theme consistent. Sometimes homeowners and/or contractors install too many types of things that work against each other. It is preferable to use one type of hardscape or stone that flatters the color of the home as well as the architecture. Whether the design theme is modern or traditional, try to stick with that style and be consistent throughout the landscape. Often times "less is more" and a simple landscape can be most flattering. 2. Visually you want to try and lead people's attention to the front door. You can downplay surrounding areas in order to give the most impact to areas leading to the entry. The impact can be achieved through color of the plant material or front door as well as with a beautiful walkway that draws you in. It is nice when the entry is visible from the street when possible and not overgrown with shrubs and trees. 3. You can often block undesirable elements of a site, such as an unkept neighboring property or a view of a busy street, with strategically placed trees and shrubs. 4. Accessories can be very important elements to a landscape. You can have address numbers, a mailbox, and outdoor furniture that are also consistent with the design theme of the architecture and landscape. Even if you don't plan on sitting in your front yard, a bench properly placed can be very welcoming. Remember, less is more and clutter can be distracting. 5. Don't forget to think about how your landscape and entry will look after the sun has set. A small scale accent tree near an entry that is lit properly can really add to the curb appeal in the evening hours. It is also welcoming in the evening as well as safe to have an entry walk and address numbers well lit. Often outdoor lighting is underutilized and, when it is done properly, it can accent key elements of the landscape as well as the home itself. David Pedersen has been designing landscapes in Orange County, California, for over 25 years. During that period of time he has collected lots of stone samples. For awhile they were stacked around and starting to pile up. In order to better display them we had "Brick's Custom Masonry" create a hodge-podge (for lack of a better term) walkway that leads to our office entrance. Pete's artisans did an amazing job and the walk is quite beautiful. Although the walkway utilizes just a mere fraction of what is available in hardscape, it is very inspirational and can get the ideas happening. Dave is always keeping updated on what Stones and other hardscape materials are available. He is an expert at finding just the right stone for your architectural style. Feel free to stop by and take a look at our gorgeous walkway. According to "Pantone", the color of the year is forecasted to be "Honeysuckle Pink." 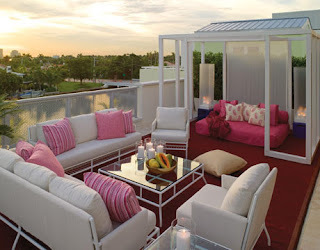 It is expected that pink will be popular in the fashion and interior design industry. If you have a desire to carry out the pink theme in your garden, here are some suggestions for people living in the moderate Southern California climates. Here are the plant names in order from left to right: Azalea, mixed floral basket, Hydrangea, Cyclamen, Calla Lily "Gem", Dianthus, Impatiens, Taylor's Perfection Camellia, Chandleri Elegans Varigated Camellia, Gerber Daisy, Verbena, Hybrid Tea Rose "Bewitched", Geranium species, Black Tulip Magnolia Tree, Primrose, mass planting of ornamental Kale, African Trailing Daisy, Ornamental Kale, Carnation variety, Primrose, Colombine, and Honeysuckle. Most of these are annual color (seasonal), but the Azalea, Hydrangea, Camellias, Geranium, and the Magnolia Tree are Perennials but only bloom seasonally. 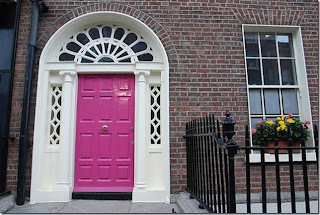 If you just want a touch of pink in your garden and don't want the time and financial commitment of changing your landscape you may consider doing "pink themed" containers by your front entry. 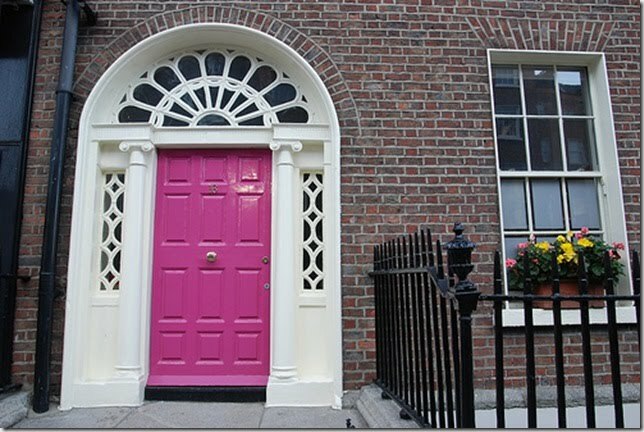 If you have a cottage style home you could even paint your door a shade of pink and then change it up when "Pantone" comes up with a new favorite for next year. You could also consider adding some pillows on your patio furniture in a pink Sunbrella fabric. Sunbrella is a good fabric choice because it withstands So. Cal. sun and is fade resistant. Whatever you decide to do in your garden enjoy and get ready for some outdoor entertaining. Spring is coming soon. Photos of flowers taken by Nancy Pedersen. Photos may not be used without permission of the photographer. The murals at Newport Harbor High School are finally complete. murals on the Irvine Avenue side of the school which is great because that is the side we see most often. We showed an architect friend of ours some photos of the murals and his response was different from what we expected. He said "what a shame that someone designed a building that was so unattractive that they had to put murals on it." Well, coming from an architectural stand point we can understand where he is coming from. It was very sad to see the old Gothic Revival style building destroyed and the new building does not even come close in its integrity. Well, that being said, we are stuck with the new building and we are delighted that Tom is taking on the huge and time consuming task of designing and painting these incredible murals to make these stark walls appear more beautiful. In the summer we take advantage of the local school fields and let our dogs off leash so that they can run. We usually cut through the local high school, Newport Harbor High, and often end up at a nearby junior high. We have been noticing two enormous and beautiful murals evolving on the side of one of the new buildings. They are giant and impressive and it is hard to feel the actual scale of things unless you are standing underneath them. Most of the time when we walk by and admire the progress of the murals the artist has been on a lift, very high in the air, and unavailable to talk. Yesterday, however, he was doing some work closer to the ground level and we got to chat with him. I was very curious as to whether he had always been an artist and if he had studied art in school or if he was a natural talent. He introduced himself as Tom Seibert and answered that he had gone to UC Riverside and was a biology major. He had taken art history as well but had not officially studied art. I thought it amazing that someone could take an idea and translate it into something so enormous onto the side of the building. We asked if he had always been talented at painting murals and he humbly answered "I don't know if I am." We are going to continue to walk by and visit this mural as it is getting finished. He believed there would be another two weeks worth of work on the project before it would be completed. Other people have passed by to admire his work as well. Tom mentioned that on the weekend a wedding party had happened upon his mural and asked if they could take some portraits in front of his project. He had also had some young visitors stopping by every day on their way to swim lessons. These lucky youngsters actually got to help him out with a bit of painting on the ship mural. They will forever be able to proudly say they helped with this beautiful piece of history. Visit Tom's website to see some more of his beautiful works.